Capt. Bill Lindsay shows off a snook taken in the waters around Chokoloskee, Florida, where he specializes in fly rodding for snook in less than three feet of water. Bob Stearns photo. AS DO MANY game fishes, snook usually offer the most angling excitement when they have the least water to work with. I learned this for the first time one calm, sunny day many years ago while fishing with Chico Fernandez aboard my flats skiff along a sandy beach in the Florida Everglades. I was poling, and Chico was on the foredeck with fly rod at the ready. From the platform I spotted a huge snook leisurely coasting along the shoreline, very tight to the edge and in less than a foot of clear water. Much of its back was completely exposed, dorsal fin backlit and glowing yellow in the sun. Its heavy belly dragged in the sand, leaving a smoky trail behind. Chico saw the big fish moments later, and we both knew that the first cast had to be absolutely perfect; there simply would be no second chance. I held the boat quietly in place with the pushpole and Chico waited patiently until the snook emerged from behind a partially submerged tree stump. Chico dropped his bushy streamer softly on the water just a foot in front of the snook’s nose, and the fly instantly disappeared in a big explosion that splashed water several feet up on the dry sand. Instead of heading for deeper water as we both expected, the big snook reversed course and raced right back through the stumps and tree limbs scattered along the shoreline. I poled my brains out chasing that fish in frantic hopes of keeping it from getting tangled up in something. After 15 minutes of furious pushing and squeezing that skiff through impossibly small openings, Chico was able to grab it by the jaw and lift it aboard. The brute weighed 18 pounds on my hand scale. It has been said that on a calm, bright day permit become so flighty they flush from your backcast. Well, under those same conditions snook often have already bolted by the time you even think about picking up the rod. Even if snook water isn’t anywhere near as clear as a typical permit or bonefish flat, snook are still so skittish that a close approach in thin water is at best difficult. It’s as if each snook comes factory-equipped with angler-avoidance radar. On a bright day, just the shadow from a fly line in the air is enough to send them exploding for deeper water. But that does not mean they are uncatchable under those circumstances. You just have to be very sneaky about how you go about it. Normally, you’d think that the right place for the fly to land in a situation like that would be three or four feet in front of the fish, allowing it to slowly sink until the fish closed the distance by about half, just as you would for a bonefish. But keep in mind that, unlike bonefish, which feed deliberately and methodically along a flat, snook are ambush predators that bite first and ask questions later. If they have too much time to assess the situation, they might conclude that something isn’t quite right. When it comes to ultraskinny water of less than, say, 18 inches, gently dropping the fly right in front of the snook’s nose can create a bite-or-flight situation. Sometimes it doesn’t work, but often it does, in which case accuracy and casting technique are everything. It’s also interesting to note that a fly landing softly five or so feet behind a cruising snook will often cause the fish to make a sudden 180-degree turn and go back for it. The caveat is that the snook must never see the fly or line in the air or the party is over; but it is worth a try when conditions won’t allow casting in front. Once in a while, I’ve encountered snook on the same flat as bonefish, tarpon, and permit. This seems to happen more often along the Caribbean coast of Central America, and the drill in such situations is that one rod should be rigged for bonefish with an appropriately light tippet, and another for small tarpon and snook with a 40- or 50-pound-test shock leader. If two anglers are aboard, each has one of these rods always at the ready. Captain Lindsay's Inverted Muddler. David Klausmeyer photo. But much of the time snook seem to prefer water that is not so clear. Sometimes the only way you know a fish is there is because it is pushing a wake, and maybe there’s a little of the yellowish dorsal showing. Often this push turns out to be a cruising redfish or small tarpon, but in that cloudy water they will eat the same fly. Do not, however, assume that just because the water is a bit turbid snook cannot see you. If you get close enough for the fish to see your casting motion, or if the boat makes too much noise, your only reward will be a loud explosion and a muddy trail streaking for deeper water. On a small flat, if one fish bolts, the rest inevitably follow. Also unlike bonefish or permit, snook are frequently stationary. They especially like to lie in ambush alongside submerged objects where they are nearly invisible. On those flats with dark sea grasses surrounding white potholes, they prefer to hang out along the darker edge where they are harder to see. Your best chance for a hookup is a long cast while the boat is still a good distance away, even if you cannot see a fish. Snook often prefer dark, muddy bottoms where they can blend in even if the water is clear, especially if they are not moving. So don’t be afraid to cast to any “fishy” objects you spot. Dark bottoms are especially popular during a warming trend after a cold spell because they heat up faster than the surrounding water. As a rule, fishing afoot for skinny-water snook is confined to walking the water’s edge on gently sloping, sandy beaches. Most of the flats and mangrove shorelines they otherwise prefer have soft mud that will quickly make you wish you had never tried wading. This is a boat situation, for sure. In more open areas, the traditional flats boat will work just fine, as long as it is quiet. So will a johnboat if you make a conscious effort to really keep it as silent as possible. But it is hard to beat a canoe for getting back into those shallow little bays and creeks that are so prevalent in snook country. Most bigger boats can’t get there, and even if they could, some parts of the deeper interior of Florida’s Everglades National Park are no-motor zones and thus off limits to powerboats anyway. I cannot overemphasize the importance of stealth. All fish in skinny water are very noise- and pressure-wave conscious, but snook are by far the most sensitive. On dead-calm days in very shallow water it is common to see snook over a hundred yards away fleeing from the bow wave of an approaching boat, no matter how silently it seems to be moving through the water. Capt. Bill Lindsay is a skiff guide operating out of Chokoloskee at the north end of the Everglades National Park. He specializes in skinny-water snook fishing, with most of his effort directed toward sight fishing for them when conditions permit. Bill prefers the spring months, from late March through May, as the best time for sight fishing. But he also points out that June through August can be good early and late, combined with fishing in somewhat deeper water during the midday heat. Bill likes the lower half of the tide for skinny-water snookin’ because during high water the fish often get so far back in the mangroves they are not reachable. He also feels that the type of bottom is very important. As a general rule, he finds more snook over soft mud or sand rather than hard rock. But most important is that the mud, and to a lesser extent soft sand, muffles both the thrust of the pushpole and the noise from the hull as it moves through the water. A hard bottom unquestionably magnifies both. 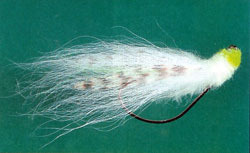 Bill is an excellent fly tier and has experimented with a lot of variations. He ties some of the most effective patterns I have ever seen. His favorite is a very slow-sinking Muddler, 3 to 4 inches long, tied inverted on a 3/0 hook (not a bentback hook) with some of the wing covering the point to make it relatively weedless. In clearer water he prefers all white, or white and chartreuse, but for turbid water it’s dark brown or black (for the strong silhouette effect). Most of his anglers use a floating line and an 8- to 10-weight rod. Speaking of leaders, a snook’s lips are many times more abrasive than those of a tarpon of equal size. That means using a shock leader of at least 50-pound-test, but 60-test is even better since there is always the possibility of hooking a big tarpon. He strongly recommends fluorocarbon because of its toughness. 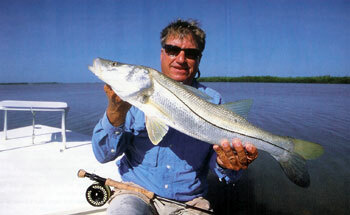 A double-digit snook will usually go through 30-pound-test and often even 40-test. His largest snook on the flats so far weighed 26 1/2 pounds (on 20-pound tippet class), and it readily ate a tarpon fly tied to an 80-pound-test shock leader. Most skinny-water snook fishing takes place in southern Florida south of Cape Canaveral on the east coast and south of Tarpon Springs on the west coast. On the east side, this is very often along a sandy beach. I like early morning best, before a lot of foot and boat traffic gets going. Some anglers will use boats and cast back toward shallow beaches anywhere from the West Palm Beach area on up through Stuart to Sebastian Inlet. On the west coast, look for shallow snook anywhere from Naples to Flamingo, and especially in the endless bays, coves, and creek mouths inside the boundaries of the Everglades National Park. Keep in mind that whenever they are found in skinny water, snook are always very much on guard. Your best bet is a cat burglar’s approach and a long, carefully placed cast. Distance and accuracy are more important than the fly itself in most instances, and be extra careful not to rock the boat. Otherwise, the only shot you’ll get is at the tail wake of a spooked-out snook.